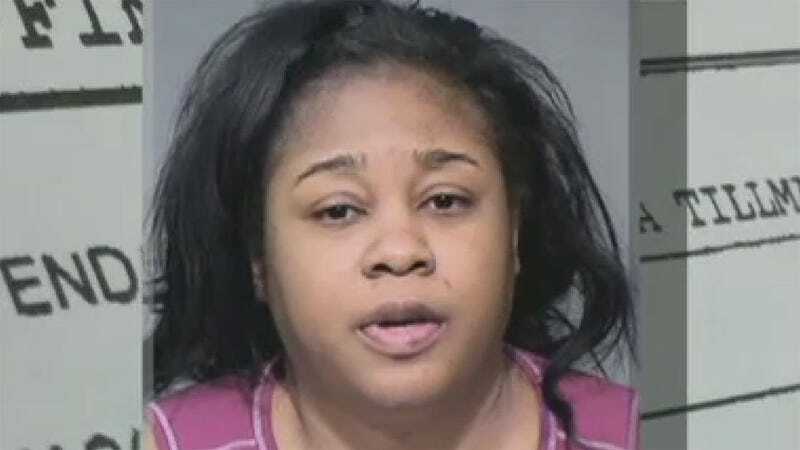 Allegedly enraged over her five-year-old son's playing of a video game he received as a Christmas gift, Jutrina Tillman of Phoenix, Arizona, dragged the young boy into his bedroom and began to strangle him before threatening to kill him and his 13-year-old sister with a butcher knife. Around 10PM on Christmas night Phoenix police received a 911 call from Tillman's hysterical daughter, claiming the woman was attempting to kill her and her younger brother over a video game. Tillman, who had reportedly been drinking throughout the day, flew into a rage over her five-year-old son's playing of a new game he received as a holiday gift earlier that day. According to the daughter, the mother grabbed her son by the arm and dragged him into his bedroom. Hearing screaming, the daughter entered the room to find her mother strangling her little brother. Tillman stopped attacking the boy, leaving the room only to return with a six to eight inch butcher knife, pointing it at the girl's chest and brandishing it towards the boy, threatening to kill them both. When the daughter broke free and ran outside dialing 911, the mother grabbed the boy and bore him back inside the house, choking him with the crook of her arm. Fortunately police arrived before either child was seriously hurt. Upon their arrival Tillman attempted to flee to a neighbor's house but was taken into custody. The children are safe with relatives today, while Tillman herself is police custody, facing two counts of aggravated assault with a deadly weapon.